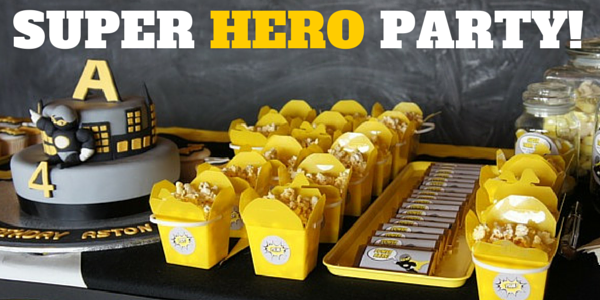 Ideas and Inspiration | MyInvites :: PARTY OF THE WEEK: A SUPER HERO PARTY DESIGNED BY A SUPER DUPER MUM! Angela’s little Super Hero was Aston who was turning 4. 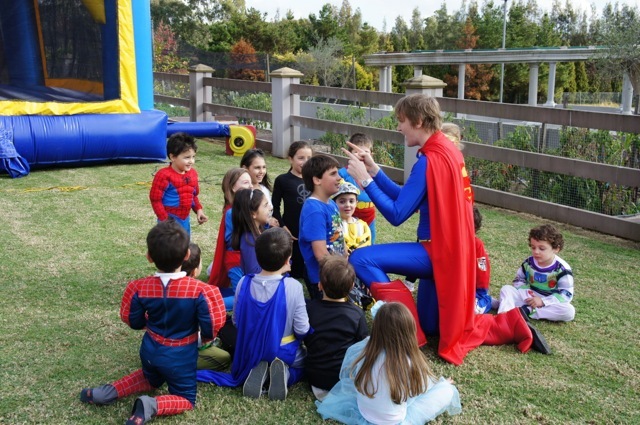 As a super energetic boy always seeking adventure and fun, a Super Hero party seemed perfectly fitting. Thanks to a generously sized venue (grandparent’s home) with plenty of space for little Super Hero’s to run around, and a wood-fired pizza oven (YUM – What Super Hero doesn’t LOVE pizza? ), the theme came together in a POW-WOW-erful way (sorry, couldn’t help myself). Angela chose 3 strong colours to use as the base for decorating. 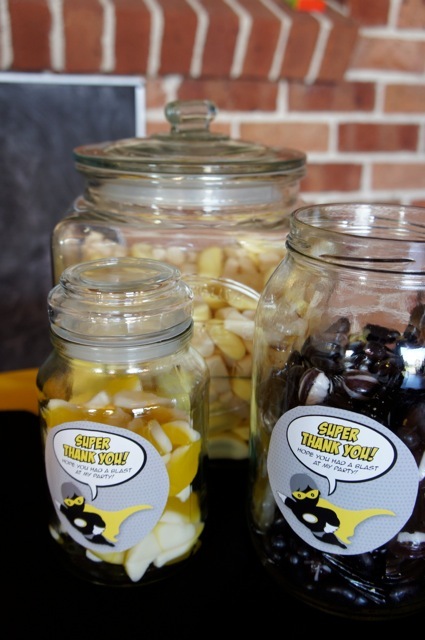 As you can see, the yellow really popped and the grey and black gave the event more of a modern twist. We’re BIG FANS of this colour choice and as you can see by Angela’s photos, they work beautifully together. Use these Batman invites by clicking here. If you’d like to have a more colourful Super Hero Party invite, or your little one is more a fan of Spiderman, Superman or the Green Lantern, our Ka-Pow design below would work just as well with a black, yellow and grey themed party like Angela has created. Use this invite by clicking here. Another thing Angela points out is that there are loads of online resources to help you to create a Super Hero theme yourself. This theme is a great D.I.Y party project because of the printable labels and party decor available online. We love the way Angela has personalised everyone’s little glass drink bottles. This not only avoids confusion but also wasted plastic cups that tend to get littered around the party. The culinary component of this party was also super-duper. Guests chose from wood-fired pizza, roasted pork with salad & antipasto. The little Super Heros also enjoyed some home made chicken nuggets and rice balls. Clearly, no one went hungry at this party! 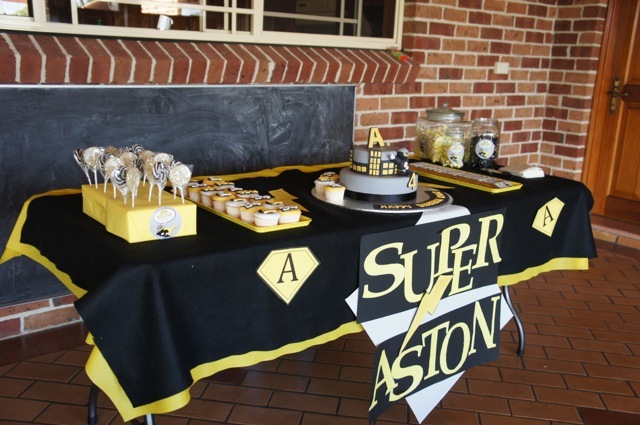 Angela recommends Super Heros Inc for kids party entertainers. She loved that they were professional and that the characters/actors were so interactive and fantastic with the children. 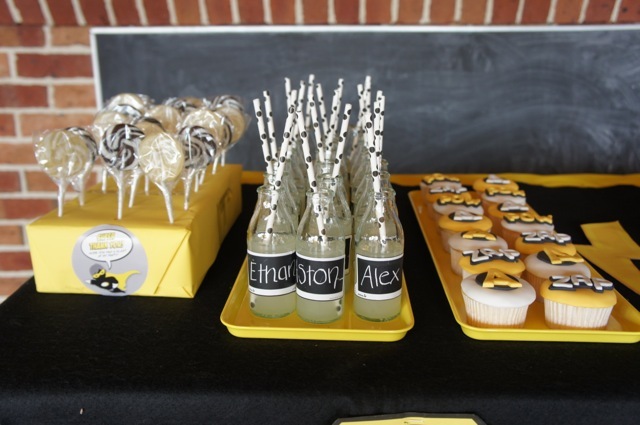 The party was completed with gorgeous Super Hero cupcakes, lollipops, popcorn, sweets and chocolate bars… as you can see it’s the awesome little details that make this party extra special. Every goodie was labelled and the choice of treats matched the colour theme perfectly. There’s no rest for this mum with 3 young children, Angela’s next project is her son’s Holy Communion in June. We have no doubt it will be extra special! Does Angela have any advice for creating beautiful celebrations? “Kids don’t want the party to drag (…and neither do the parents!) If the children are entertained, there will be less chaos & less fighting. Wrap it up within 3 hours at which point children start to get tired and grumpy. Thank you Angela for sharing this really brilliant party with us. 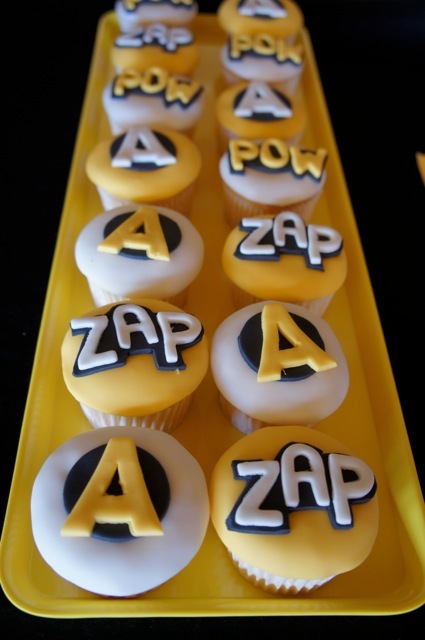 Do you have a Super Hero Party to plan? View all of our online invites here!